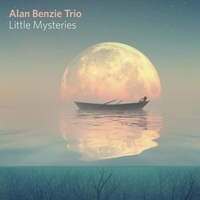 bebop spoken here: CD Review/Gig Preview: Alan Benzie Trio - Little Mysteries - TONIGHT! Little Mysteries continues in a similar vein to the previous album with more musical portraits drawn from his travels. This is the perfectly integrated trio. Three individuals united by a common goal. Benzie's compositions are beautiful and sensitive. He gives no explanation as to their meanings in the notes but says he will explain to those who are interested at the gig. His piano explorations don't need words, just receptive ears of which I'm sure there have been plenty during his 16 concert European tour which culminates at the Globe (tonight the trio are at the B-Flat Jazz Club in Berlin). On bass, Andrew Robb, himself a BBC Young Scottish Jazz Musician of the Year winner in 2009, plays some intriguing lines both solo and as an integral part of the trio. Drummer, Marton Juhasz, has an impressive CV of Hungarian percussion awards and, on this showing, deservedly so. Benzie, Robb and Juhasz live in different countries which makes the empathy between the three of them all the more amazing. Little Mysteries by the Alan Benzie Trio is available digitally from CD Baby, Amazon and iTunes. Physical copies can be obtained from www.alanbenzie.com/buy Or, if not sold out, at a gig. February 22: The Globe, 11 Railway St., Newcastle NE4 7AD. 7:30pm. Details.